Advanced Floating Sliding Panel is the Best Plugin to create sliding panel with unlimited controllable tabs within a minute. Advanced Floating Sliding Panel is a WordPress Plugin which offers a wide range of features with Beautiful Design & Great Functionality. Create Vertical Sliding Panel with single or multiple tabs to catch visitors/users attention for your special content such as forms, announcements or notifications panels. Create Horizontal Sliding Panel with single or multiple tabs to catch visitors/users attention for your special content such as forms, announcements or notifications. Create & Design Unlimited Tabs for Sliding Panel according to your needs and requirments with its easy to use pre built theme builder by seleting options for tabs. Create & Design Unlimited Sliding Panels without any limit.You can create multiple instances of sliding panel with any combination of features. Display anything as a floating sliding panel using shortcodes such as Contact forms, image gallery, slider or whatever shortcode you have, it will display it in the content with various options. Embeded your vidoes from all popular video sites such as youtube,vimeo,dailymotion or your own custom created video and display as floating sliding panel with all pro features. Display any type of third party widget or ads as floating sliding panel such as google adsense, buyandsell ads, any wordpress widget or any other third party scripts. All 4 Sided positions are supported i.e Left, Right, Top, Bottom with other features such as 100% or customized width for horizental sliding panels and 100% or customized height for vertical sliding panels. Theme Builder included with improved features. You can create unlimited themes & layouts in a minute using its defualt theme builder which supported both tabs and panels. 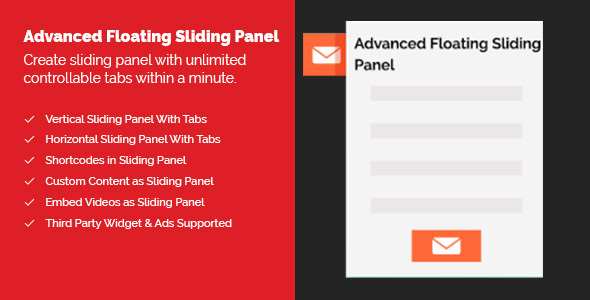 Advanced Floating Sliding Panel is bundled with accepting all shortcodes. Contact forms, image gallery whatever the shortcode is, it will display it in the content. It’s supporting all types of content, you can use simple text or decorated html styled content, third party ads or wigets. And also display any content with shortcode from any plugin or custom made. Advanced Floating Content WordPress plugin has detailed documentation to understand all of its feature and functions. This WordPress plugin is a handy tool which built in mean for user freindly interface of backend with easy wording so you can use it without any coding knowledge. Advanced Floating Sliding Panel Plugin is made with clean and optimized easy code to understand developers for easy to customized. We wait round the clock to support you whenever you need us, with our utmost loyalty. You can reach us 24 hours a day, 7 days a week and 365 days around the year. Homepage Visibility for your sliding panels to enable or disable display on homepage with a single click. Search Pages Visibility for your sliding panels to enable or disable display on search page with a single click. Archives Pages Visibility for your sliding panels to enable or disable display on archives page with a single click. Easily show or hide sliding panel on specific pages or on all pages with selecting options, no coding required. Easily show or hide sliding panel on specific post or on all post with selecting options, no coding required. Easily show or hide sliding panel on specific taxonomy or on all taxonomy with selecting options, no coding required. Easily show or hide sliding panel on specific post types or on all post types with selecting options, no coding required. Easily show or hide sliding panel on specific WooCommerce Products Pages or on all WooCommerce Products Pages with selecting options, no coding required. Easily show or hide sliding panel on specific WooCommerce Category Pages or on all WooCommerce Category Pages with selecting options, no coding required. Easily show or hide sliding panel on specific bbPress Pages or on all bbPress Pages with selecting options, no coding required. Using Advanced Floating Sliding Panel you can show or hide sliding panel on mobile, tablet and/or desktop. You can now display different sliding panels for every device! Users Logged In Visibility for your sliding panels to enable or disable display only for logged in users with a single click.